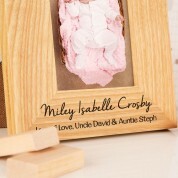 Remember your favourite moments from all those wonderful parties or celebrations with this beautiful bunting frame. It's a wonderful gift, especially for babies and children. The design features a string of delicate bunting across the top of the frame, with a cute spots and stripes pattern. The bottom of the frame has the recipient's name in a scripted font, with space for a personal message or date below. The portrait frame holds a 4 x 6” photograph, and it'll look lovely sitting anywhere in the home. It's the perfect place for your favourite photo!